Captive is the second book in The Blackcoat Rebellion series by the super talented Aimée Carter. I was really excited to get back into this story, as I really enjoyed the first book in the series, Pawn. I really loved Kitty in the first book, but found her to be a bit frustrating in Captive. Yes, I love that she is such a strong character, but there were more than I few times that I wanted to tell her to pipe down before she got herself in some serious trouble, or worse. I like my characters strong, but I also like it when they know when to stop and think as well, and it felt like Kitty was constantly putting herself in danger throughout the book. Knox is a character that has intrigued me since I first met him in Pawn. I can’t quite seem to figure him out, and he’s always managing to throw me twists right when I least expect it. I’m really looking forward to meeting him again in the third book. As in the first book, the romance really didn’t overpower the story for me in Captive. The relationship between Kitty and Benjy felt comfortable and awkward at the same time. Meaning that they’ve known each other for so long that their relationship feels comfortable, but when they try to be more, it’s just really awkward. Ah, first love. The storyline for the book followed the same plot for the first book, but the settings for each book were so completely different. I had grown used to the world that Kitty had been first thrust into when I read Pawn, that the world she was thrown into in Captive was so insanely different. Elsewhere is the most terrible place to ever have to be, and the descriptions of the place and all the things that Kitty/Lila went through where just horrible. It was hard to read at times. However, I did enjoy the twists that were thrown throughout the story, one massive twist that I kind of saw coming since the first book. I can’t wait to see how the story plays out in the end. 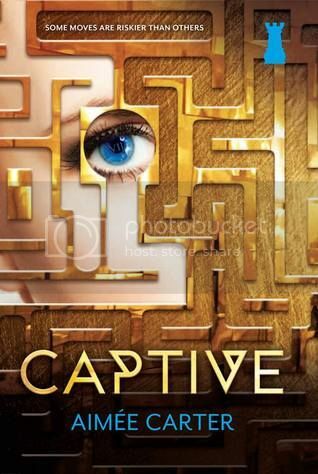 Overall; While I didn’t love Captive as much as Pawn, I still really enjoyed the story. I’m really looking forward to getting my hands on the next book in the series, Queen, which will be out in 2015! I completely agreed about Kitty, she was about to get someone killed! I think I love Knox, I'll know for sure in Queen!